Want to share your passion with a group that won’t judge you? 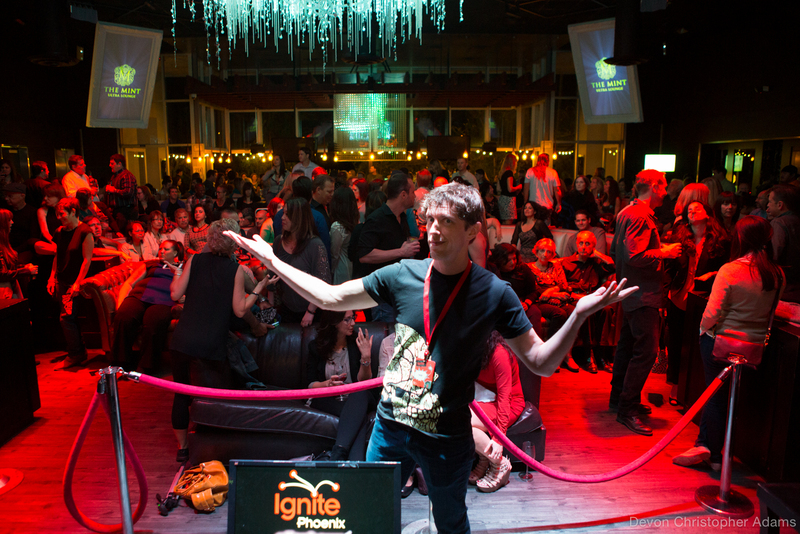 If so, then Ignite Phoenix After Hours (IPAH) is for you! We welcome subjects that make people think, just like Ignite Phoenix, but this is After Hours. This is 21+. Not exactly Spartacus, but pretty close. IPAH gives you a chance to tell people truly interested in hearing what you have to say, and they are non-judgmental. Our fans want to hear the stuff you can’t talk about at work. We have created a venue to open up and share those ideas in a safe place. This is, in short, an adults-only water cooler. Our audience knows they won’t always like everything they hear, but they respect you’re up there, and they know you’ll be done in 5 minutes. They’ve laughed with presenters, cried with presenters, and gotten squeamish with presenters. And that’s alright by all of us. So, what’s your passion? What do you wish people could know more about in your life, that you really don’t feel comfortable telling? We want to hear it! It will only take two minutes to submit to speak – just click here and fill out the form! This entry was posted in Uncategorized and tagged events, Ignite Phoenix, IgnitePHX, IPAH, Phoenix, Scottsdale by Amy Donohue. Bookmark the permalink.